Welcome to Week 15 of the One Yard Wonders Sew Along! 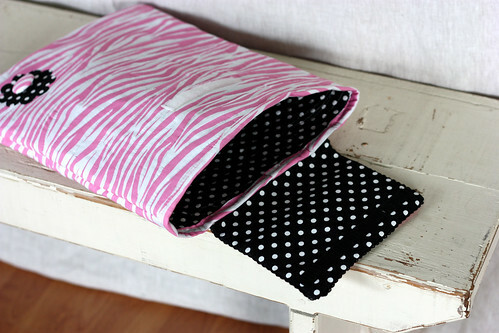 Tracy selected Robert Kaufman Metro Living Zebra Stripe Pink and Michael Miller Fabrics Dumb Dot Black. This was a fun, easy project with clear, easy to follow instructions. 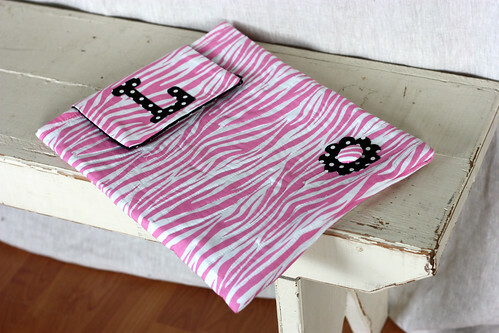 Tracy chose the pink zebra print for the outside with the black and white polka dotted fabric for the interior. The fabric was machine quilted using a walking foot with random stitches between the zebra stripes. She used the dot fabric and fusible web to make a monogram on the flap and a flower on the sleeve. Add a covered button for extra embellishment. The directions say to size the sleeve by measuring around the lap top and add 1.5 inches which worked great. On the length, add 2.5 inches to the measurement. When finished Tracy would have liked a bit more length…maybe 1/2 inch; next time she’ll cut long and then trim it if needed. The pattern calls for home dec weight fabric. Quilting cotton seemed fine with batting (she used fusible fleece). For more stability, Tracy did fuse interfacing to the flap and the flap lining of the quilting cotton. 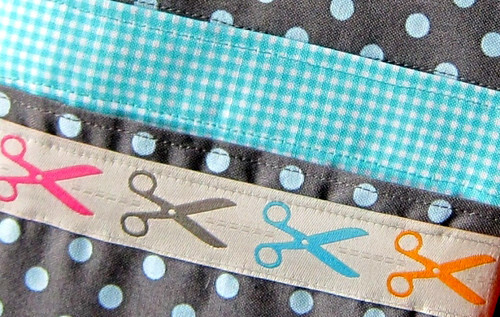 The pattern designer suggests binding the inside edges with double fold bias tape and the top edge with fabric binding. Tracy used the pink fabric for both. She was happy with her results. She machine stitched the top edge binding rather than hand stitching with a blind stitch as called for. To continue the black accents, a tiny trim with a scalloped edge was added the flap when sewing the layers together. Tracy’s daughter said the Laptop Sleeve was “flippin cool.” Yahoo! She likes it. Alicia chose 2 fabrics. Michael Miller Fabrics Dumb Dot Gray and Michael Miller Fabrics Tiny Gingham Aqua. Alicia is using the CD case to store circular knitting needles. 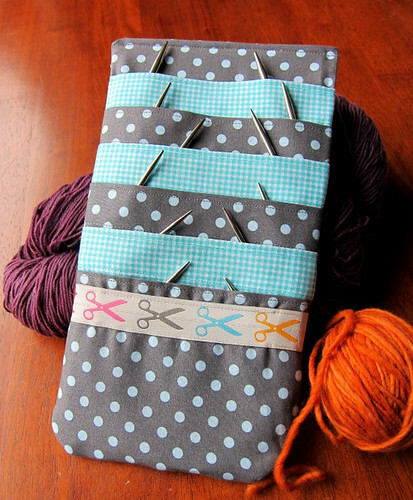 The case has 12 slots (6 on the front, 6 on the back) so you can store at least 12 circular needles. 12 inch and 16 inch sizes fit the best. The directions were clear and easy to follow. Make sure that you are sewing through all layers on the middle fold (one of the last steps). Don’t sew too close to the folded edge or you won’t catch all the layers. Alicia plans to add a ribbon loop on top so she can hang her case from a hook. The case is too cute to hide away in a box! The scissor and scalloped trim used in both projects were provided by The Ribbon Jar …it’s always fun to add a little trim as an accent!